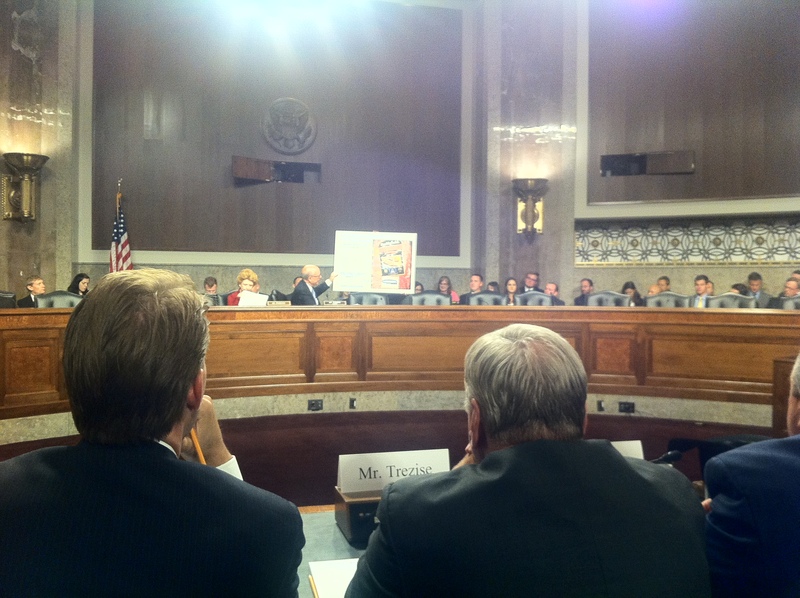 Washington D.C. — Today the Senate Agriculture Committee held a hearing on the Country of Origin Labeling dispute. A list of U.S. commodities, including wine, faces over three billion dollars in tariffs from Canada and Mexico. WineAmerica Board Member and New York Wine and Grape Foundation President, Jim Trezise, spoke to the effect that these tariffs would have on the wine industry. Other panelists included representatives from the North American Meat Institute, the American Farm Bureau, Cattlemen’s Association, Kansas Livestock Association, Archer Daniels Midland Company Corn Processing Business Unit. 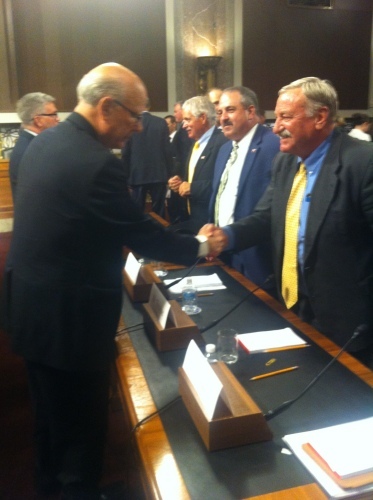 The hearing was lead by Senator Pat Roberts (R-KS), Chairman of the Senate Committee on Agriculture and Ranking Member Senator Debbie Stabenow (D-MI). Mr. Trezise presented the need for swift legislative action and the need for full repeal of COOL. Canada and Mexico have repeatedly stated that full repeal is the only solution that they will accept. 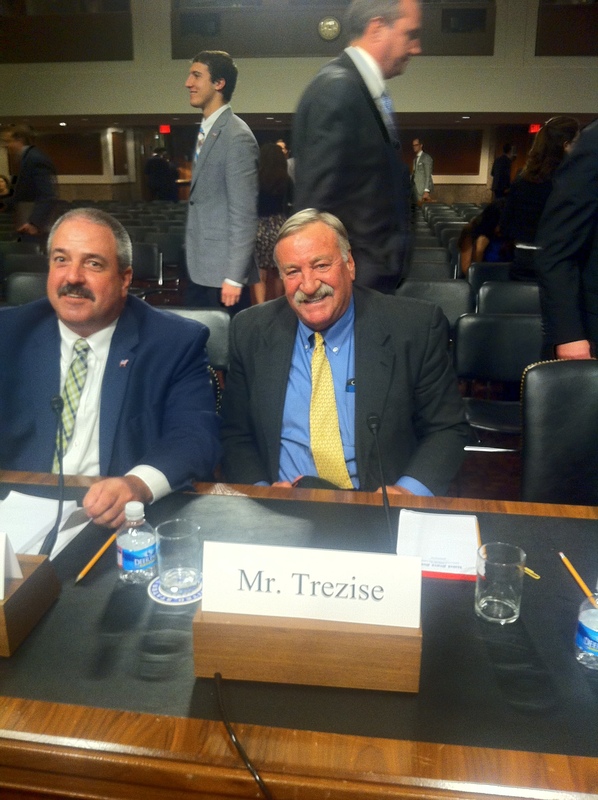 Additionally, Trezise addressed the importance of the Canadian market for New York and other regions. Canada is the largest export market for U.S. wine, and the proposed tariffs will have a devastating impact on the the American wine industry. WineAmerica thanks the Senate Committee on Agriculture, Nutrition, and Forestry for holding the hearing on COOL and for inviting a member of the wine industry to testify. Background: Country of Origin Labeling, or “COOL,” is a law requiring retailers to indicate the country of origin on a cut of meat. In 2009 Canada challenged the American implementation of this law at the World Trade Organization (WTO). The WTO ruled in Canada’s favor and has continued to do so in all subsequent appeals. With today’s final ruling, Canada and Mexico will be able to levy tariffs against American products. Wine is on the preliminary “hit list” made public by Canadians. Tariffs against American wine will be a huge hit to our industry. Canada is the largest foreign market for American wine. Last year U.S wine exports to Canada reached $487 million, a 7% increase from 2013. Retail sales for American wine in Canada now eclipse $1 billion. In 2013 the U.S. was the second largest exporter of wine to Canada, with a 16% market share among wine imports sold in Canada. The preliminary Canadian plan would place a tariff on wine based on the value of the product entering the country. For example, a wine with a $10 import value would be hit with a $10 tariff, doubling the cost of the wine sent into the country. Apart from the immediate financial loss, the American wine industry could face long term effects. Raising the price of a bottle of a US wine will hinder competition with other wine regions, notably South Africa and Australia. The United States could lose shelf space that would take years to regain. Current Action: Earlier this month the House of Representatives passed a bi-partisan bill repealing the COOL requirements. With the August congressional recess looming, and with the WTO review period ending on August 17, the Senate must act quickly. The Canadian and Mexican governments have made it clear that, short of a full repeal of the COOL meat labeling rules, the tariffs will commence. If the COOL rules are not repealed, the tariffs will go into effect as early as September and will last at least two years. With the August congressional recess looming, and with the WTO review period ending on August 17, the Senate must act quickly. The Canadian and Mexican governments have made it clear that, short of a full repeal of the COOL meat labeling rules, the tariffs will commence. If the COOL rules are not repealed, the tariffs will go into effect as early as September and will last at least two years. WineAmerica, working with our partners at the Wine Institute, proposed to the Senate Agriculture Committee that Jim Trezise represent the wine industry at this hearing. 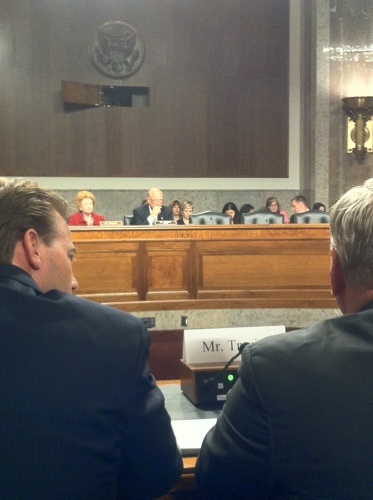 His testimony will stress the need for swift legislative action and the need for full repeal. Additionally, Trezise will address the importance of the Canadian market for New York and other regions. Canada is the largest export market for U.S. wine, and the proposed tariffs will have a devastating impact on the the American wine industry. The hearing will begin at 10 a.m. EST. The Senate Agriculture live streams its hearings through their website. If you would like to watch the hearing, the live stream can be found here: Country of Origin Labeling and Trade Retaliation. John Murphy, Senior Vice President for International Policy, U.S. Chamber of Commerce: Why Canada and Mexico Have the Whip Hand in the COOL Dispute. Washington, D.C. – Today the World Trade Organization Dispute Settlement Body issued their final ruling against the United States country of origin labeling (COOL) requirements for muscle cuts of meat. What does that mean for the wine industry? If the United States does not repeal its COOL rule, Canada and Mexico will retaliate with substantive tariffs on a variety of American products which could include wine. Country of Origin Labeling, or “COOL,” is a law requiring retailers to indicate the country of origin on a cut of meat. In 2009 Canada challenged the American implementation of this law at the World Trade Organization (WTO). The WTO ruled in Canada’s favor and has continued to do so in all subsequent appeals. With today’s final ruling, Canada and Mexico will be able to levy tariffs against American products. Wine is on the preliminary “hit list” made public by Canadians. Tariffs will largely affect California wineries, but smaller, family owned wineries in Oregon, Washington, New York and Michigan will also be impacted. In 2014, Washington wineries exported a total of $7.5 million in total wine sales into Canada. Oregon sent almost 22,000 cases of their wine across the border in 2014. Canada has sixty days to submit a dollar amount to the WTO for retaliation. Once the WTO approves the amount they begin to implement tariffs on targeted commodities. While we hope wine will be omitted, WineAmerica’s government affairs team is actively lobbying Congress to support a legislative fix, including but not limited to a repeal of the COOL regulations, before any tariffs on U.S. wine exports can be implemented, which could be as soon as the end of the summer. For more information about COOL visit www.coolreform.com. View list of American commodities potentially targeted by Canada. 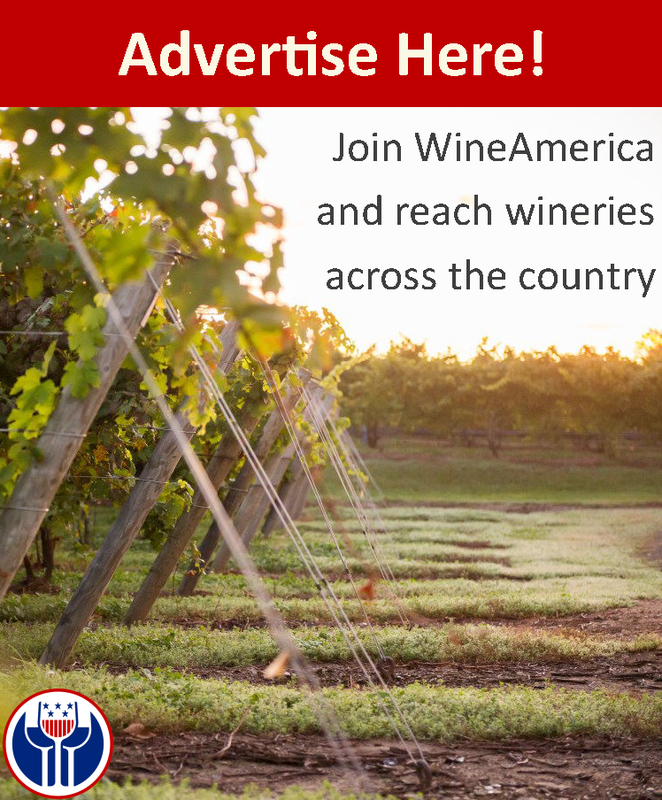 Learn more about WineAmerica and wine industry advocacy at www.wineamerica.org.